Become More Disciplined And Consistent In Their Positive Attitudes Towards Math! "Arissa and Aiden started with Oodles Learning in P3 because I wanted them to have a good foundation in lower primary for easier transition to upper primary. Since joining Oodles Learning, Math is their love and they are motivated to learn and challenge themselves on higher-order thinking questions. Both my kids have definitely become more disciplined and consistent in their positive attitudes towards Math!" “Since Primary 5, Ke-ian J has found it rather challenging to solve those problem sums that require much analysis to unlock, fear started to seep in and his confidence was taking a beating. Then came you! Yes! You with the drive and energy, the vibrant teaching method that commands student's attention with great ease. Naturally, Ke-ian regained his composure and confidence. After 6 months, Andre’s math showed huge improvement. They Are So Much More Confident In Solving Problem Sums… Grades Definitely Improved! 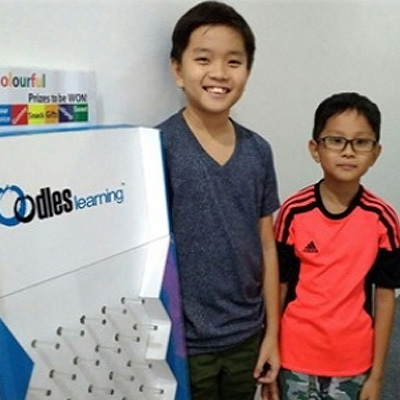 "Before joining Oodles Learning, my two children, Gabriel and Alexius were both not confident when working on problem sums. We are so happy that our boys are in Oodles Learning because since joining, they are so much more confident in solving problem sums and they also do it independently. Yes, their grades have definitely improved! Thanks to the coaches and also to the friendly and patient staffs at Oodles Learning." Outstanding P5 Final Semester Math Performance Within 5 Months! "Shannon has always been a hardworking student but she faces a lot of difficulties when encountering challenging problem sums. With your dedicated guidance, we are amazed at Shannon’s outstanding P5 final semester math performance within 5 months of attending Oodles! My wife and I are so convinced with Oodles that we immediately enrolled our 2nd child Sharlotte as well! We trust & look forward to your continued assistance in bringing out the best in our children with your team"
“Ashley’s Math results were not consistent in school. In fact, most times her marks were at borderline. Aside from her careless mistakes, she had difficulty understanding the problem sums. I had tried placing her in other tuition centres. Not only it did not help, her confidence level became lower. “Miko failed her Maths in SA1, scoring only 47/100. My niece recommend onSponge to me because they are good in problem solving. Without hesitation, I got Miko enrolled and she started her lessons in June 2014. “My boys have joined Oodles Learning since last year. They have shown a lot of improvement, especially their positive attitude when attempting problem sums. In less than 8 years Oodles Learning has coached almost 10,000 students in mathematics. More than 95% of our students improved by at least one grade. More than 83% of our students are referred by satisfied customers.